Becker’s Nevus is a form of a localized Hypertrichosis or excessive hair growth. Hyper pigmentation or an area or patch of dark skin most often accompanies the Nevus, which usually occurs predominately in males. Becker’s Nevus is so named for Doctor Samuel William Becker who first documented the condition in 1948. The nevus or navei, usually appear on the upper torso, like the shoulders, or the back. 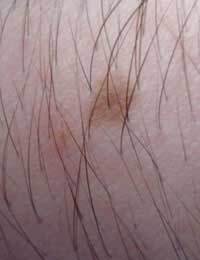 The Becker’s Nevus usually appears as an irregular brown patch. Sometimes the Nevus is associated with acne in and around the area. While an exact theory of why a Becker’s Nevus forms remains unclear, they are almost always the result of a trauma or injury to the area – such as a burn. The first two cases documented by Dr. Becker were in fact found on two young men with severe sunburns.There is believed to be a genetic abnormality that predisposes someone to from the Nevus. There has been at least one documented case of a congenital Nevus, that is one that was not the result of a direct injury, but that is exceedingly rare. The Becker’s Nevus seems to appear predominately in men. That, coupled with the excessive hairiness that presents with the Nevus, seems to suggest that their formation can be somewhat related to an excessive amount of male hormones, but that has yet to be proven. The Becker’s Nevus has presented in women, and in fact some clinicians suggest they can be just as common in women as in men. In either case due to the usual large size, abnormal shape and hairiness, the Becker’s Nevus is a source of self-consciousness and embarrassment for many. Should I be Concerned About a Becker’s Nevus? With few exceptions most people with a Becker’s Nevus are otherwise healthy. Other then the underlying condition that may have given rise to the Nevus, such as a sunburn, there is very little evidence to suggest that a Becker’s Nevus, has anything other then aesthetic repercussions. Though unsightly, physicians refer to the Nevi as benign lesions that pose little or no medical threat. Still, as with any unusual skin lesion, a Becker’s Nevus should be tested for signs of skin cancer. However there have been no reports that indicate that the skin cells within a Nevus are any more likely to be malignant then in ordinary skin cells. There is no actual treatment for a Nevus sufferer. Dermatologists suggest keeping the area of a Nevus from sun exposure which will only deepen the pigmentation and make it more noticeable. If there is acne in and around the Nevus, standard topical acne treatments have proven to be effective in treating the accompanying acne. There are treatments that can be performed by any competent dermatologist or plastic surgeon that have been shown to effectively reduce the appearance of a Becker’s Nevus. They are most effectively removed using a surgical laser procedure. The laser treatments are most effective because they can remove both the excessive unwanted hairs of the Nevus, and usually the hyperpigmentation as well. The laser treatment is not 100% effective in all patients, but the appearance of the nevus is significantly reduced by the treatment. There was a recent study of patients having the Becker’s Nevus treated with a laser known as a YAG laser. The YAG laser has proven to be the most effective surgical laser on the Nevus. The study found that 54% of those who underwent the treatment received 100% clearance of the nevus and 50% achieved 50% or more clearance of the lesion. With rare exception the only reason to have any treatment done to a Becker’s Nevus is for cosmetic concerns. But for the person who has grown self-conscious over the appearance of the lesion; that may be a very good reason indeed. @cutesmile03. You should ask your GP whether the treatment mentioned in the article is suitable for you and whether it would be available on the NHS. I have been living with beckers nevus for since i can remember.Its stsrt small bout the size of a dime not it covers the backof my left leg . Its extremely hairy which i shave and really dark in color and looks like a lot of moles together.I hate wearing short or skirts or dresses. Im embrassed . I wish that one thing i csn change bout my self. I would love towearsummer clothes n bikini like everyone else. What can i do to light it up or get rid of it ..